The Eastern Crabbet Arabian Horse Society will present awards to the highest placing purebred, half Arabian, or Anglo-Arabian Crabbet-related horse entered in the 2017 Tevis Cup. Ribbons will be awarded to a Senior and Junior rider. You must be pre-entered, and your horse must be ECAHS certified to be 25% or greater Crabbet bloodlines before the deadline entry date. The Eastern Crabbet Arabian Horse Society was organized on December 4, 1994 for the preservation of Arabian Horses that trace their lineage to the original Arabian horses utilized by W.S. and Lady Anne Blunt, Judith, Lady Wentworth, C. Covey, the Crabbet Arabian Stud of England, and the Sheyk Obeyd Stud of Egypt. Every dude ranch in the West tries to offer their guests a little taste of cowboy adventure. An afternoon or an overnight trail ride with a campfire and a cookout under the stars fulfills most people’s hunger for a little cowboy flavor. But there is another kind of adventurous soul out there, one who hankers for a big juicy bite of the wild; one who doesn’t mind a bit of gristle here and there. That is the kind of soul Whitney Wiltbank likes to design trail rides for, and the kind of trails he likes to ride himself. Wiltbank, a CPA based in Eagar, also helps run the other family business — Sprucedale Guest Ranch. The ranch is located southwest of Alpine along 11 miles of Forest Service gravel roads, near the headwaters of the Black River in the Apache-Sitgreaves National Forest. In a sport with a motto that declares "to finish is to win," the American Endurance Ride Conference has produced a lot of winners. The nonprofit organization has recently launched a new award program for horses that have competed for 10 or more years, completing at least 50 miles of AERC competitions each year. The award is a complement to the highly coveted AERC Decade Team Award, given for horses-and-rider teams who have completed endurance rides (50 miles or longer) for 10 or more years. "There should be more recognition of our members whose equines compete year after year at any distance, while maintaining the well-being and health of their equines," said Terry Woolley Howe, of Southern California, the organizer of the award program. "This program recognizes the equine regardless of who was the rider so long as the owner is an AERC member, the equine was entered in AERC's mileage program, and the equine completed at least 50 miles a year at any AERC-sanctioned event," said Howe. To date, owners of nearly 800 equines have received 10-year pins. Five horses have been honored with 20-year pins, including AERC Hall of Fame equines Ramegwa Drubin, Remington and Robin Hood. Another 70 equines have earned 15-year pins. "The Equine Longevity and Decade Team awards are unique to AERC," said the organization's executive director, Kathleen Henkel. "Many new members say that AERC's emphasis on long-term goals are a key reason for choosing to join." 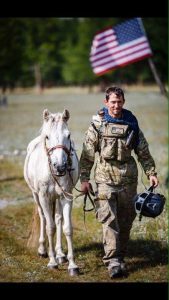 Members and their equines can accumulate lifetime mileage achievement awards, starting at 250 rider miles, and also compete for annual awards in a variety of categories. Interested in pursuing a 10-year Equine Longevity Award for your horse? The trail to that recognition will start with a single 25- or 50-mile AERC ride. For information about AERC or to request a Discover Endurance Riding booklet, visit aerc.org/New_Members_Page.